free slot play, and free match play! 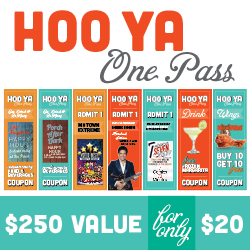 Purchase your Hoo Ya One Pass today! Aren’t you just a little curious what goes on in here? Yes, we know how to have fun. Hooters Casino Hotel is a refreshing change from mega-casino hotels and an awesome secret for those in the know. From standard rooms and suites with views of Las Vegas and the Strip, the Hooters Casino Hotel guest rooms have all the amenities to make your stay in Las Vegas a winning one. Of course, we have world-famous Hooters wings! But we also have Steak ‘n Shake burgers and fries, Pizza Hut, Krispy Kreme and Ben & Jerry’s. Welcome to a casino floor that is intimate, friendly and has games that do not cost a fortune. The newest slots, $1 Blackjack, and dealers with personality is what you will experience. This is a gamer’s paradise and the Strip’s best kept secret. Exclusive price for Hooters Casino Hotel Guests. $20 in advance when booking your room or at check in gets you admission to shows, Happy Hour including food and drinks, and more! Non-Hotel guests may purchase Hoo Ya for $49.